Aquallusion is a clear resin for the floral industry. It provides that crystal clear water effect. 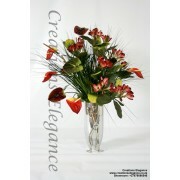 It is formulated especially to give the final quality touch to your finest floral silk displays. It gives very high UV resistance for maximum clarity life. Avoid prolonged exposure to direct sunlight whenever possible. FR58 - FH59 is a flower resin, also known as Aquallusion Resin, especially designed to offer a crystal clear water effect. Formulated especially to provide the final touch to your finest floral silk displays. It offers the highest UV resistance possible in a clear resin for maximum clarity life. ..